To those who have generously donated toward the huge expansion of our Majengo Orphanage...!!!!! With your help, we have raised $8, 685. up here in Canada over the last few weeks, and I can't thank you enough for supporting us at this very critical time. 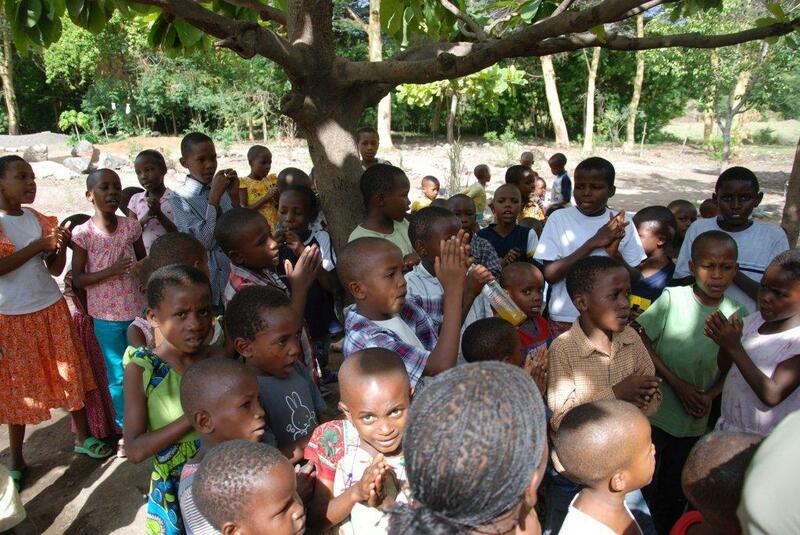 As I have written the last few blog posts, the Tanzania government shut down 5 corrupt orphanages on the safari route through the middle of our village, three weeks ago, and dropped off 60 new kids to be added to our orphanage! In many cases these kids have been badly abused, neglected and intentionally kept sick and poor in order to lure in more tourist dollars. We now add these 60 new live in kids to our current 28 children - between the ages of 9 months and 13 years - totaling 88 living in children we now look after. (plus an additional 20 children living-out with relatives, assisted by us either with educational needs, food, medicine, etc. ) Totalling well over 100 children! Plus staff! Food, shoes, uniforms, medicine, educational fees, basic needs....!! And a triumph too, that the Government of Tanzania closed down 5 corrupt orphanages on the safari route., and entrusted those kids to us. We opened and renovated two new houses next to our main facility, in October. We built 17 bunk beds per house, with new sheets, blankets, mosquito nets and mattresses. We've moved 25 kids into each house...both with a mama matron. We're operating out of one outdoor kitchen, with 4 cooks, creating 300 meals a day. 4 cleaners, to wash sheets, clothing, houses and kids. 2 teachers dealing with with 43 preschoolers. A secretary and treasurer who pull it all together, pitch in and do everything. This has become a massive undertaking, and scares me to death! I am going over with Matt (see below) for a couple of weeks, leaving January 24th. I’m in touch with Majengo everyday, they have hired 4 new people to keep up with the unbelievable demand of work, especially cooking and cleaning for 88 children, 14 staff day after day, week after week!! I can't imagine! We will work on budgets, who and how many kids are going to what schools? Measuring uniforms. Shoes. General clothing.. How many in our in-house pre school? Do we have to hire more teachers? Pictures, bios, histories of the new kids. I toss around all night worrying about this, but from them, I'm told that they are coping! That the kids are happy, with huge smiles on their faces! But it must be crazy. I'm dying to get over there and see it for myself. In March 2007 I was taken to see 52 little kids, all orphaned by HIV AIDS, on a mud floor foyer, one small window, no furniture, leaking roof with pools of water here and there. The neighbours pulled this daycare together, bringing in bits of food for lunch, the women cooking over a fire in the back yard. One outdoor toilet, a hole in the ground. Together with local NGO, ICA TANZANIA, we decided to take this on. We found an unfinished house down the road to fix up. In 2007-8, thanks to the 250 people who helped out, we raised $25,000 to renovate and furnish this house - we have it for 4 years, rent free. So engrossed to get Magengo up and running, I wasn’t thinking, staff, food, education, medicine, upkeep! Matt McKissock of Warren, Pennsylvania called to rent our cottage that summer three days before I was leaving for Africa. He was fascinated. What are you doing? How many kids? Tell me more!! With the cottage contract, I sent pictures of the children we hoped to help. He fired back a cheque for $500. Over that weekend, he became obsessed. He couldn’t get those kids out of his mind. On Monday, he called three times: what were the operating costs?? We didn’t know how many kids, how much staff, cost of food, uniforms, shoes...I would know when I got over there. He kept calling. Tuesday, Wednesday. Could I come down to Pennsylvania. No. Finally. I told him, if you are so interested in Africa....why don’t you come and see for yourself!!! Right! I left for Tanzania Wednesday night. One month later, he arrived with two friends, for one week, with 8 duffle bags stuffed with everything we asked for: computers, clothes, shoes, school materials, maps, ABC charts. They met the kids, played, sang, and did juggling tricks, got to know the staff, village leaders, our ICA local organizers....and made a movie. Matt went home and made a commitment. To raise funds with family and friends, to cover our operating costs!! When I got that email, I bawled my eyes out! $41,000 a year! 28 kids living in; 25 living out but coming to our pre school with breakfast, lunch and dinner. At that time 10 staff. And these wonderful people were committed to supporting us fully, not just now, but for the years to come. WE demand four things from our staff: to love the children, 100% honesty, competence and to be hard working. We pay them well, and support their own children’s education. Up until now things have been running smoothly. But with 60 new kids!! It is a HUGE DEAL, Our budget will double this year. I have promised Matt that I will help...and again, for those of you who sent checks, I thank youy so much!! Every bit counts, believe me! I am in the process of applying for Charitable Registration in Canada. So that soon I hope to be able to offer tax receipts. But until then, I can not. The Warren Majengo Foundation, 218 Liberty Street, Warren, Pennsylvania. 16365. Majengo is a hands on operation in Tanzania...There are no ‘middle men’. Every cent we raise here goes straight to the children.. I am putting together a group of people here in Canada who would like to get more intimately involved: to get the word out, to help with fundraising, to help organize speaking engagements, to involve their families and friends. WE need all the help we can get!! Please call me if you are interested! It is the most important and worthwhile work I have ever been lucky enough to be part of. I wish you all the very best in the new year...and again, thank you so much for helping to change the lives of these 88 little people...truly...I wish you could come over to visit yourself! And if you can...please call me!! 416-951-6528. Please pass this along to friends....if I could do a slide show presentation at any of your organizations, groups, friends, let me know!!! The picture above is of the new kids who just arrived from the corrupt orphanages. How different they look from pictures we have posted of our 28 live in kids who have been with us for 2 and a half years...thank you again!